How Can I Trust the BeID Runtime? As a Belgian citizen, the federal government issued me an electronic ID (eID). It’s essentially a smart card with personal data, my picture (jpeg) and a couple of X.509 certificates for authentication and digital signing. One of its applications is authentication on web sites. And this is already possible now, provided I’ve a smart card reader and I install the necessary software provided by the federal government. 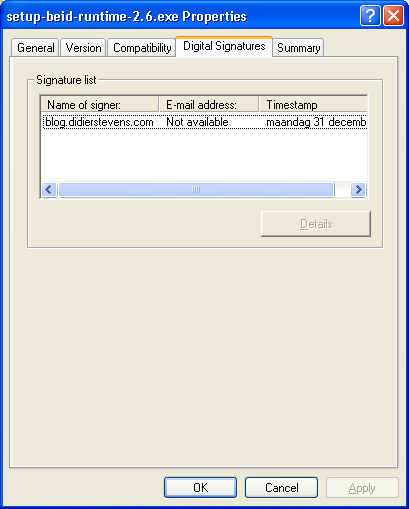 That’s right, the installation program is not digitally signed (AuthentiCode). 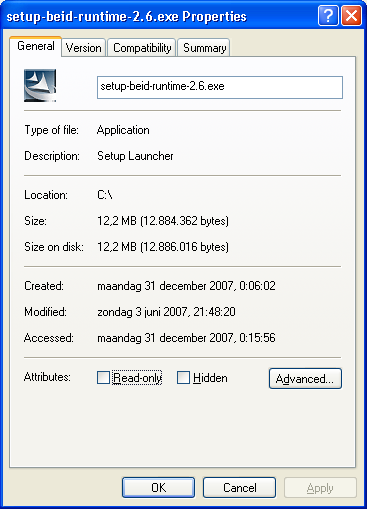 Neither are any of the executables installed by the installation program. I’m surprised that the government invests in a PKI to issue IDs to all its citizens, yet it doesn’t deem it necessary to invest in a delivery mechanism that certifies the origin and integrity of the client software. As I promised last week, here are the technical details of the Pocket EICAR Test File Server. I bought a mini AVR web server from Tuxgraphics, it’s an AVR microcontroller with an Ethernet controller on a small PCB. The goal is to integrate some sensors (like temperature) and actuators (central heating) into my home network, but my first project was to learn to program it and develop a small web server framework. The board is ready for operation, I just had to solder 2 wires to provide power and a programming connector. You’ll need an AVR In-System Programmer to upload your compiled C program to the microcontroller. Tuxgraphics sells one that plugs in a USB port, and has the big advantage for me that it comes with a Linux Live-CD with all the programming tools on it. This way, I didn’t have to spend time to build my own developing environment. First I tested the web server, programmer and LiveCD on a real computer with an example from Tuxgraphics. After being satisfied that it worked, I created a virtual machine, booted from the LiveCD, configured networking and sshd and now I develop on that VM. But because it’s a LiveCD and settings are not persisted, I have to take a snapshot before shutting down the VM. Likewise, you have to write code to handle ARP requests, which are essential for IP operation. Use one entry per web page. The first pointer of each entry points to the URL you want to server, like /info.html. The second pointer is the content type, like HTML or plain text. And the third pointer points to the static content you want to serve. Set this pointer to NULL for dynamic content. So if you just want to serve static pages for HTTP GET requests, modifying the code doesn’t require real programming skills. In the source code, just change the MAC address and IP address, redimension the website array and populate it with your pages. In this example, we check if the index of the requested page (iHTTPURL) equals the index of the status.html page (URL_STATUS). If it does, we call the MakeStatusResponse function that will generate the web page displaying a counter. 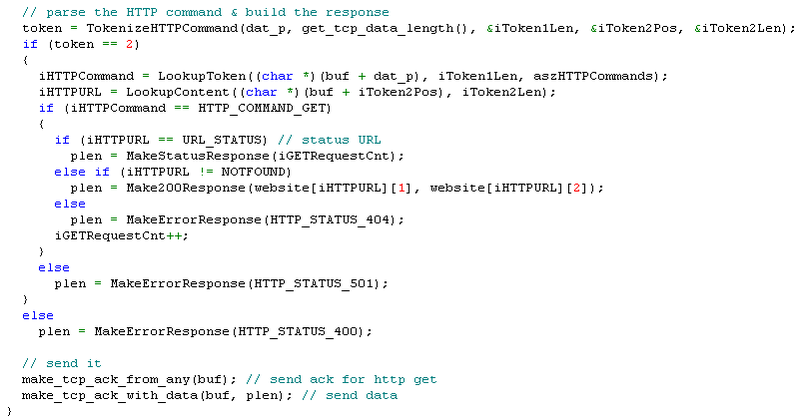 You have to realize that this is a very basic HTTP server. It doesn’t keep state for the connections and it’s not multithreaded. If you need a more robust embedded web server, there are solutions like the FOX Board, it runs the BOA web server under Linux. 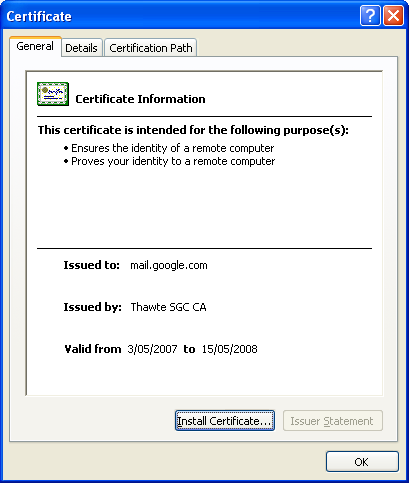 I recently had to inspect the SSL certificate of an e-mail provider (secure POP connection) . 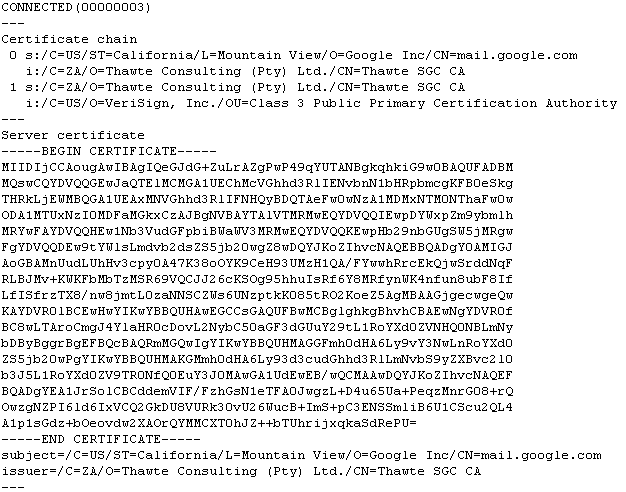 Here is a quick HOWTO using the Google Mail website as an example. Then cancel the command with CTRL-C.
Like last year, I produced an anti-virus related Season’s Greetings movie. The movie is hosted here on YouTube, and you can find a hires version (XviD) here. Next week, you’ll get the technical details of this pocked web server. I added the SafeBoot registry keys for Windows 2000 SP4 Professional to the zip file and updated the post. I’ve developed a new application for my N800, psurveil (Photo Surveillance). It automatically takes pictures with the N800’s build-in camera at regular intervals and stores them as jpeg files. 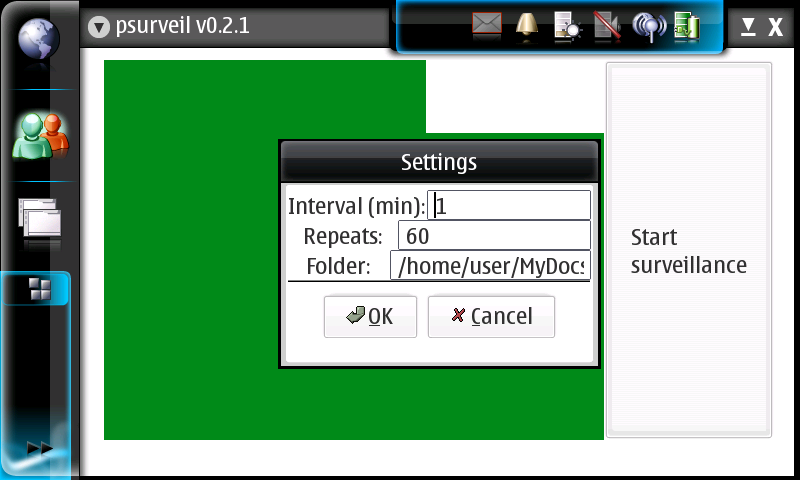 You can find the installation package here (unzip and copy the deb package to your N800) and the source code here. And be careful, it’s beta. On my N800, it takes about 30 seconds to start, and it doesn’t run as root. So if you’ve got a baby and are looking for an excuse to get an N800, this turns your N800 in a baby monitor, kinda. psurveil (Photo Surveillance) is a program for the Nokia N800. and stores them as jpeg files. – Pop out the camera, and close all programs using the camera. – Start psurveil. On my N800, it takes very long to start, sometimes a half minute. – Use the menu to review the settings. – Interval is the number of minutes between pictures. – Repeats is the number of pictures to take, minus 1. – Folder is the directory to store the pictures. The directory must exist. Settings are stored with GConf, and there is no input validation. is immediately saved, and another picture every Interval minutes, and this Repeats times. The filename of the jpeg is composed with the date & time when the picture was taken. There is no monitoring of free diskspace. These settings will take 4 pictures over a period of 4 minutes, starting when the button is clicked. I developed this program by merging the example_camera.c and example_alarm.c Maemo example programs. There are some quirks in the real-time video display, they originate from the example_camera.c program. If you know how to fix this, let me know. so use this program at your own risk, and respect the privacy of others.